Want to know about prices of bitcoin and entereum? 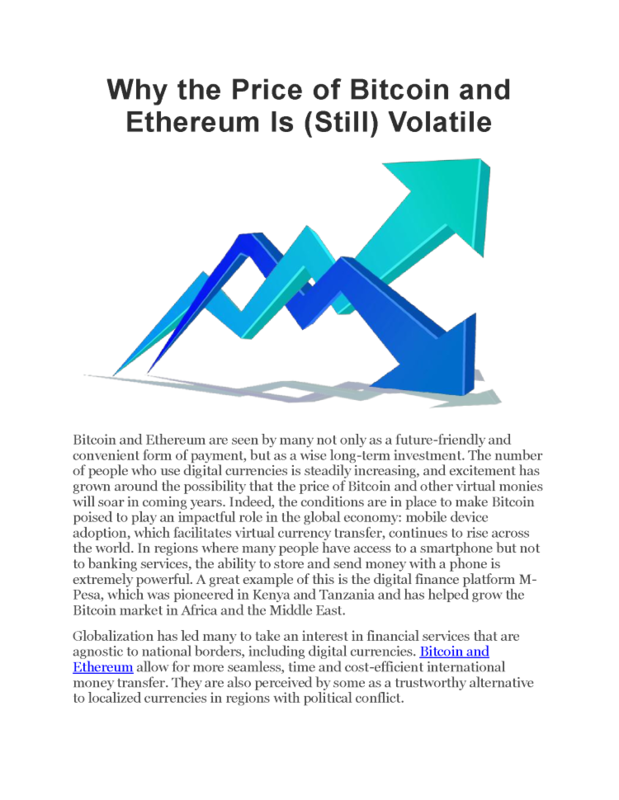 Read https://www.draglet.com/blog/bitcoin-ethereum-volatility full blog here and know about Price of bitcoin and ethereum. Why the Price of Bitcoin and Ethereum Is Still Volatile Bitcoin and Ethereum are seen by many not only as a future-friendly and convenient form of payment but as a wise long-term investment. The number of people who use digital currencies is steadily increasing and excitement has grown around the possibility that the price of Bitcoin and other virtual monies will soar in coming years. Indeed the conditions are in place to make Bitcoin poised to play an impactful role in the global economy: mobile device adoption which facilitates virtual currency transfer continues to rise across the world. In regions where many people have access to a smartphone but not to banking services the ability to store and send money with a phone is extremely powerful. A great example of this is the digital finance platform M- Pesa which was pioneered in Kenya and Tanzania and has helped grow the Bitcoin market in Africa and the Middle East. Globalization has led many to take an interest in financial services that are agnostic to national borders including digital currencies. Bitcoin and Ethereum allow for more seamless time and cost-efficient international money transfer. They are also perceived by some as a trustworthy alternative to localized currencies in regions with political conflict. policy. The irony is that blockchain technology which powers Bitcoin and Ethereum is often touted as “trustless” because it is so resistant to human tamper. The automation that helps make it more secure also makes many people uneasy. The mystery that surrounds digital currency means that bad press has an even stronger capacity to hurt its price than it does on other investments. On the other hand the novelty and intrigue of the technology often means positive hype can lead to more quickly rising prices. Bold investors eager to dip their toe into an exciting new trend have plenty to be interested in here. Any perception shift that could cause the value of more well-established assets to rise or fall will likely manifest as an even larger swing in the price of BTC Ethereum and so on. As electronic currency becomes more widely accepted this may change. But perception is not the only reason digital currency is volatile.As noted one of the most attractive features of virtual currency is its inherent suitability to the global market. Digital nativity means that international transactions cost much less in terms of overhead. Indeed virtual currency has helped us envision a world where sending and receiving money is as easy as sending and receiving email. But as businesses and individuals all over the planet begin to embrace this as an option national governments have had to grapple separately with a wide range of issues regarding its regulation and role in their respective economies. Just as with perception and hype the ways that governments acknowledge digital currency can urge its price in either direction. On one hand legitimation via government recognition is positive news for the digital currency community. It means that institutional actors understand that this trend is here to last and are working on policies aimed at gaining the most social benefit from digital money. This offers reassurance to those with traditional views toward financial systems and could make for a smoother transition to an economy in which digital currencies play a more prominent role in international trade. On the other hand those who see virtual currency as a harbinger of a future in which nation-states have less agency could be turned away by the government interest here. This perspective spans a number of political ideologies and is certainly not a straightforward issue. For all of the different political opinions on this however there are also technical reasons that the presence of government mediation might give investors pause. A major benefit of the technology behind these coins is that it allows for peer-to-peer transfer allowing for the disintermediation of flows of value and information that are typically dependent on third-party administration. There is real concern about the possibility that policymakers will disturb the decentralized peer-to-peer capacity of blockchain finance. So when governments discuss oversight and regulation of Bitcoin it does not always build user confidence. This corresponds with the issue of image and perception but also bears on the technical specifics that make the concept of electronic money possible in the first place. It’s unclear whether Bitcoin and Ether will become as stable as traditional currencies or assets like gold and silver but an informed populous can certainly help.